Hi. We are The Belmont Goats. An urban respite at the Carey Blvd Greenway. 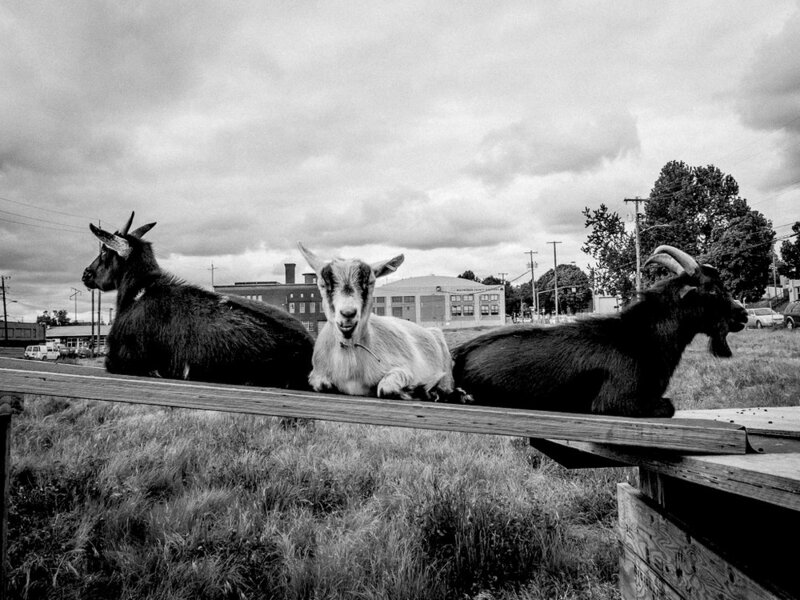 Our herd of 14 goats & 1 hen invites you to the western edge of the University Park neighborhood in North Portland. Photo: Our original home on SE Belmont St.
Portland’s nonprofit resident herd, offering an oasis of rural community amidst the built, urban environment since 2012. Learn to identify each goat, when they joined the herd, and how they are and are not related to each other. Visiting hours have not yet resumed as we let the herd settle in after their move to North Portland. Stay tuned! People from Portland and beyond have had lots to say about the restorative impact of visiting The Belmont Goats. Some answers to questions we frequently get about the herd, what it does and doesn’t do, and our rules of thumb. “Our Goats” portraits © Susan Bein. Site © The Belmont Goats.℠ All rights reserved.